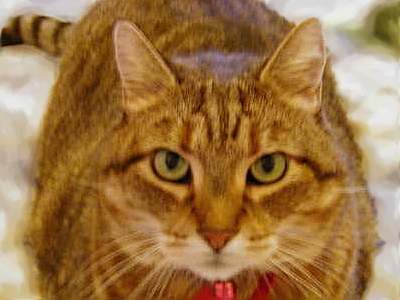 Diabetes in Cats. Oscar’s Story. Other people’s diabetic cat stories. Well, you asked for it! A potted history of fat cat Oscar, please feel free to edit edit edit! Oscar made his way into my heart by first raiding my dustbin to retrieve any scraps left in cat food tins, then by really pulling at the heart strings one day when I witnessed him jumping onto the bird table to eat the mixed grain put out for the birds. In my opinion any cat who resorts to eating birdseed is a desperate cat. His owners lived a couple of doors away but worked shifts and were hardly ever home. Oscar had no access to the house and no protection outdoors. He was extremely shy and ran off every time I even tried to get near him so I just put a little food out every day to supplement the birdseed! Over the months he would wait in the shrubs for feeding time but would keep his distance until I went indoors. Little by little his trust grew and he eventually got wise to the fact that there was more food inside our house, so he mastered the cat flap to raid the kitchen at night! Eventually he became a full time resident with us and was left behind when his loving owners moved house. Oscar’s biggest problem is that he has never got over the problem of being hungry, therefore any food left is for eating, so he grew and grew, although being a rather large cat frame wise his girth also expanded. He also took to life in comfortable surroundings, and turned into a real house bound cat! After four years of indulgence came the first signs of trouble, losing weight but eating vast amounts, but most noticeable was his almost constant drinking, from the bird bath, from his water bowl, even from the loo. His first visit to the vet was a rather negative experience, I was told by the senior vet that he just had problems with fur balls and I should groom him more! One more week went by, the weight was dropping off and the drinking was out of control, so I sought another opinion. Having done some homework my biggest worry was diabetes which I put forward as a theory to the vet, who was sceptical as Oscar didn’t have the classic sign of diabetes which is the cat’s breath smells of acetone or pear drops. I asked for a blood test and hey presto I was right, dear Osc had diabetes. This is when the shock sets in, how the heck are we going to manage, how on earth am I going to get anywhere near a nervous angry cat with a needle everyday? Well, with amazing support from vet Dom Anderton, Oscar is still here four years later. There have been some rough patches, in particular the early months of regulation, finding the right insulin, hundred of visits to the surgery, worries about hypos - will he be OK if I forget a dose, will I be alright if I stab myself with the needle! So many little unforeseen problems, not being able to go away on holiday, always having to be at home at the same time each day, keeping his food intake monitored, stopping my neighbours from feeding him when he went begging, the list is endless. The biggest break through came when encouraged by the owner of this site (Debs) I started to home blood test Oscar. One of the best things ever, it freed us from weekly visits to the vet, reducing the bills dramatically. It also has been the best form of reassurance, whenever I think he might be a little unwell a quick blood test is always first in the process of elimination. 1. It is not a death sentence for the cat, with a supportive vet and a good home routine it just becomes part of your daily schedule. After four years I don’t even think about Oscars injections, it is just part of our evening feeding routine. 2. Your cat will not pack his bags and leave home just because you start jabbing him with a needle once or twice a day. If anything the bond between you and the cat will become even stronger. 3. The biggest myth is that the average life span of a cat with diabetes is 18 months - total rubbish. Oscar’s four years as a diabetic is nothing compared with other cats whose owners are regular contributors to the Pet Diabetes mailing lists and Notice boards. Join these lists to share in the wealth of information that only owners can share. 4. Biggest tip I can give to newbies to feline diabetes is don’t expect quick results during regulation. It can take weeks/months to achieve regulation, be patient and don’t be tempted to keep changing insulin, give each a fair chance to stabilise, it can take days for changes in dose to have a noticeable effect, so NEVER EVER increase insulin dosage without professional veterinary advice. Personally I would never ever change anything about my dedication to Oscar’s well-being. As part of this household he deserves the very best. All rights reserved. I am not a medical practitioner of any sort. Implement suggestions on this site at your own risk. Whilst I believe everything on this site to be accurate, you must not follow any advice on this site without consulting your vet.